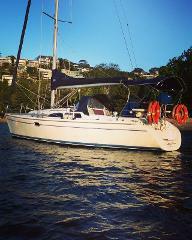 Hire our gorgeous catamaran on Sydney Harbour for up to 20 people. Perfect for any event or celebration, sail away with stunning Sydney Harbour as your backdrop. Sit back, relax and enjoy the view! 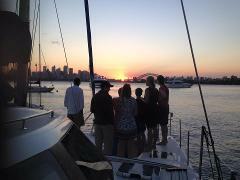 Hire a yacht on Sydney Harbour for up to 7 people. Get involved and hoist the sails or sit back, relax and enjoy the view! Sail Sydney Harbour in style on our amazing brand new catamaran 'Champagne Sailing' - purpose built for day charters in Sydney, with a great set up for socialising and entertaining. 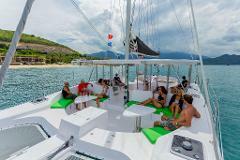 Hire a catamaran on Sydney Harbour for up to 20 people. Perfect for any event or celebration, sail away with stunning Sydney Harbour as your backdrop. Sit back, relax and enjoy the view! What better way to celebrate your Birthday than cruising Sydney Harbour? Pump the party tunes, sip on champagne & swim in one of Sydney’s beautiful bays. Enjoy complimentary bubbles for the special birthday person! Enjoy a few hours romantic sailing on stunning Sydney Harbour with the love of your life! What better way to celebrate your Hens than cruising Sydney Harbour? Pump the party tunes, sip on champagne & swim in one of Sydney’s beautiful bays. Enjoy a complimentary bottle of bubbles for the Hen! What better way to celebrate your Birthday than cruising Sydney Harbour? Pump the party tunes, sip on champagne & swim in one of Sydney’s beautiful bays. Enjoy a complimentary bottle of bubbles to get the party started!! Gather your mates for an unforgettable Bucks party! Pump your own tunes, enjoy complimentary sausage sizzle & BYO beers. Ladies/Waitresses welcome. We love Christmas and nothing beats a festive party on Sydney Harbour! Enjoy the stunning backdrop and leave the hard work to us. Enjoy delicious onboard catering, pump the festive tunes and don your Santa hat !! What better way to celebrate Christmas than cruising Sydney Harbour? Pump the party tunes, sip on champagne & swim in one of Sydney’s beautiful bays. Enjoy an Antipasto platter & BYO Drinks! We love Christmas and nothing beats a festive party on Sydney Harbour! Enjoy the stunning backdrop and leave the hard work to us. Enjoy delicious onboard catering, pump the festive tunes and don your Santa hat! 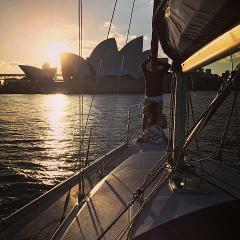 Enjoy an overnight Romantic sailing pakage on stunning Sydney Harbour with the love of your life! Experience the annual northerly migration of Humpback whales. Cruise Sydney Harbour before heading out of Sydney Heads to see these majestic creatures from the comfort of our luxury catamaran Champagne Sailing. The ultimate unforgettable proposal - romantic sailing on stunning Sydney Harbour with the love of your life, French champagne, choc dipped strawberries, delicious cheese plate and red roses!